Pool maintenance & chemical suppliers! 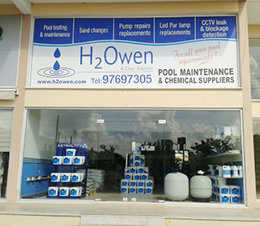 H2Owen is based in Paphos, Cyprus. We specialise in cleaning and maintaining swimming pools and providing expert advice and chemical supplies from our three outlets in Peyia, Pissouri and Chloraka. We also offer new liners, pumps, solar heating, borders, pipework repairs, leak detection, bulbs, pool covers, in fact all your pool requirements under one roof. Please click here to learn more about our Pool Cleaning Services. All staff are highly trained and through using the latest photometric testing equipment can identify and solve the most common swimming pool problems which many pool owners suffer. Our advanced testing equipment can also be used for less common and more specialised analysis which is rare to find on the island. ♦ Secret Valley ♦ Pissouri ♦ Paphos ♦ Peyia ♦ Polis and all regions in between! If you have any concerns about your swimming pool, be it the water or the pool itself, then it is highly recommended that you contact H2Owen for a fast, helpful and reliable response.